What should Allscripts users know about Infera? The Infera clinical decision support application from Inferscience is now available in the Allscripts app store. It reads structured and unstructured patient data from the EHR, then analyzes the unique details of the patient’s condition against its evidence-based clinical rules, delivering specific care recommendations in real time. Infera is integrated with Allscripts Professional and Touchworks EHRs and is certified by the Allscripts Developers Program. Once a client has signed up for Infera and the application has been activated for the client, the user can launch it by going to the Launch button in the encounter. This will initiate a single-sign on process which will lead to the opening of a new browser page which will display the patient demographics and a list of care pathways. 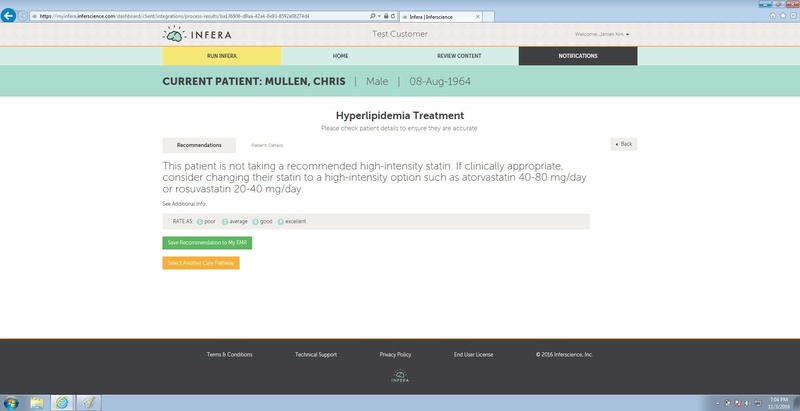 The user can also see the pathways most relevant to the patient’s diagnoses by clicking on the Top Picks button.. Once the user clicks on the Run button next to a care pathway of their choosing, Infera quickly analyzes the patient data and provides an actionable recommendation. 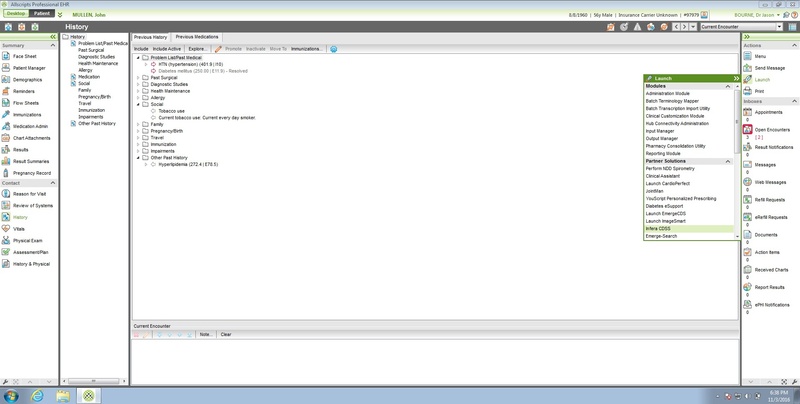 The user can also choose to run Infera interactively by answering a series of questions and getting management pointers. This image shows the place where Infera can be launched from the EHR. 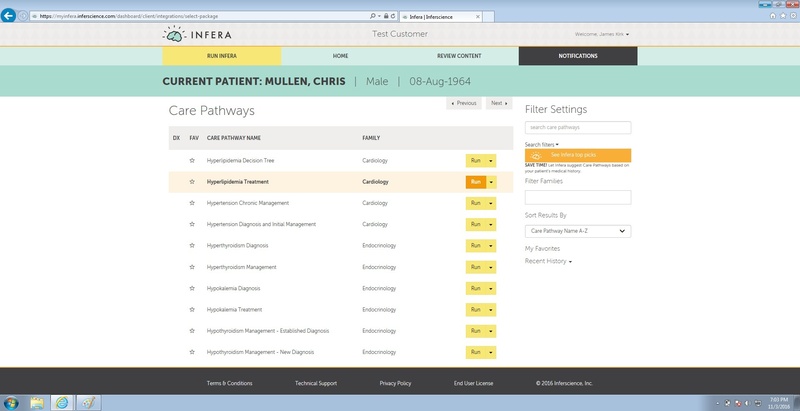 This image shows the browser page that opens when Infera is launched and has the list of care pathways inlcuded in the solution. This image shows the care pathway recommendation for Hyperlipidemia Treatment. Primary care providers should find Infera useful because it will help them to practice evidence based medicine efficiently by applying Infera’s well-researched care pathway to patient data at the point of care. It may help them avoid some specialist referrals by giving them the knowledge and confidence to manage certain conditions themselves. It will certainly save them time compared to reading a long article which may or may not address the management question they have about their patient. Infera provides valuable clinical decision support to Allscripts EHR users by allowing them to spend more time with their patients while providing quality, standards based care.